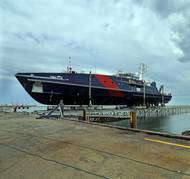 Austal launched yesterday its fifth in-series Cape Class Patrol Boat (CCPB) at the Company’s Australian Defence Facility in Henderson, Western Australia. Cape Jervis is the fifth of eight 58-metre patrol boats that are being delivered to the Australian Customs and Border Protection Service (ACBPS) by Austal as Prime Contractor under a design, build and in-service sustainment contract, valued at approximately $330 million. Under the contract, Austal is also using its in-house expertise to develop and integrate sophisticated electronic systems for command, control and communication. 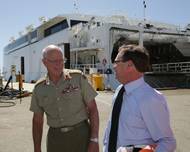 Austal receives a high profile defence delegation, including the United Kingdom’s Secretary of State for Defence, at its Western Australian facility. The Rt Hon Philip Hammond MP, the UK Secretary of State for Defence, was accompanied by Australia’s Minister for Defence, the Hon Stephen Smith, MP; Australia’s Chief of Defence Force, General David Hurley, AC, DSC; Australia’s Defence Secretary, Mr Dennis Richardson, AO and other defence personnel from both the United Kingdom and Australia. HKME is a leading engineering service provider in northern Australia with well-established operations supporting the Royal Australian Navy (RAN) and Australian Customs and Border Protection Service. HKME also has strong relationships with oil and gas sector participants. Austal Chief Executive Officer Andrew Bellamy said the acquisition signals Austal’s commitment to supporting RAN and Customs and Border Protection operations. 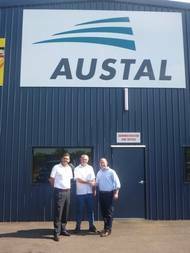 “Supporting the Royal Australian Navy and Australian Customs and Border Protection Service is core to Austal’s long-term success. Austal USA’s order backlog has grown by $691 million dollars as a result of two additional Littoral Combat Ship (LCS) contract options being exercised by the United States Navy. The contract options fund construction of the Gabrielle Giffords (LCS 10) and Omaha (LCS 12), the third and fourth ships in the 10 ship block buy award made to an Austal-led team in December 2010. That 10 ship program is potentially worth over $3.5 billion. Reflecting its growing stature in naval shipbuilding, Austal USA now holds confirmed contracts for 14 U.S.